Touching up woodwork is one of those projects we all put off, but once you know how to do it right, it’s a breeze! 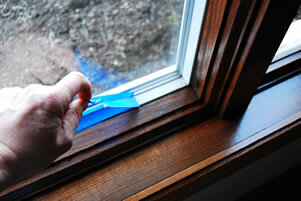 Spring is finally here and it is window opening time and time to do a little window trim maintance. Every spring, I try to do a whole house update. I walk around the house and make note of areas that need my attention. 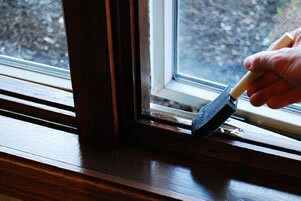 I have been putting off for a couple of seasons my stained trim – especially my windows. Most of the stained trim in my house is in great shape, however two areas really takes a beating, the east and west side of my house. Several windows seem to be in sun a good part of the day, especially in the winter when there is no shade from the trees that surround my home. The polyurethane has started to fail and the stain has started to fade. Left this way too much longer, I would be looking at a costly repair, replacing all of the trim and perhaps the windows themselves if I don’t take action. 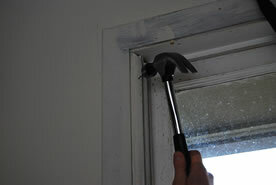 So as soon as the weather started to warm up enough that I could open the window I attacked the problem. 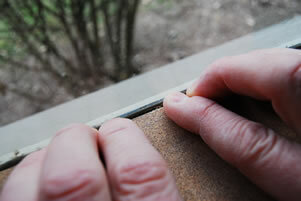 When touching up a section of trim, do the entire piece. It is easier to do this, than try to blend in the new with the old. Your eye will notice a patch but it won’t notice an entire piece of touched up trim. This is true for all painting and staining repair on any trim in your home. Make sure that you open a window when working with stain and if you are working in an area where a pilot light is on (laundry room, kitchen) turn off the gas to the appliance until the work is finished. 1. 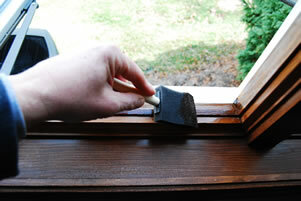 First I remove any dust from the surfaces by using a vacuum or a dust brush (an old paint brush works great). This is a must; nothing ruins a stained finish faster than dust and dirt. 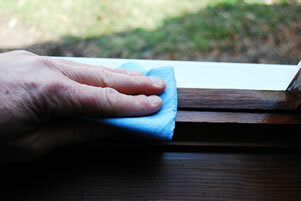 Make sure you also remove the dust from any area near the surface to be stained. 2. 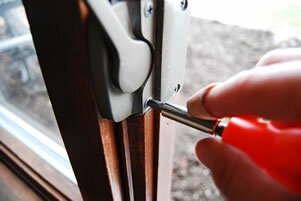 Remove any hardware that you are afraid you will get stain on or damage while sanding the surface. 3. I use a finishing pad (or a fine steel wool) and gently buff the area to be re-stained. Make sure to remove all of the flaking polyurethane and expose the stained surface. Finishing pads are great, they hold their shape and can be reused over and over, and they only cost around 3 bucks for a packet of two. 4. 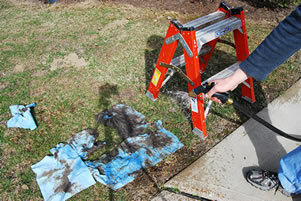 Then use a tack rag or damp soft cloth to remove the dust. I mask off any area that I don’t want stain to bleed onto with a painters tape. 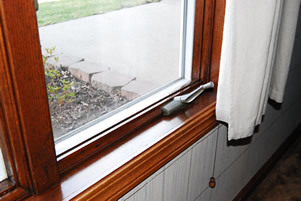 This is especially true where window casing is next to the wood trim. If you do happen to get stain on the casing remove immediately with a soft cloth. Make sure that you press the tape down with your thumb to keep the stain from bleeding underneath. As you can see, this works great! 5. Using a small foam brush apply the stain. I prefer foam brushes because they are easy to work with and they don’t require solvent to clean. Just dispose of the brush when the task is finished. I actually keep one in a plastic bag and reuse it quite often when I’m staining with the same color. You can see from this photo that a foam brush can be cut in tight to the window, just go slow and don’t apply a lot of pressure. 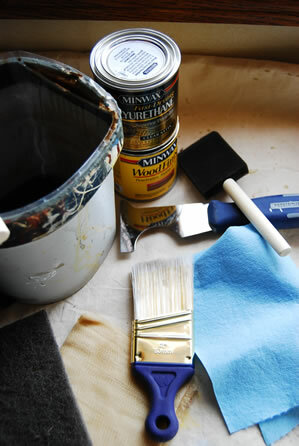 Make sure that you stir the stain before using as the solid colorants may have settled to the bottom of the can. It may look like a full stain when first opened, but without thoroughly mixing, the stain will be thin and the color/stain will be compromised. 6. 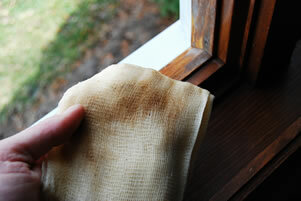 Allow the stain to sit for a few moments to penetrate into the wood fibers then wipe with a soft cloth or paper towel. When working with petroleum based products such as stain, don’t place rags or brushes in the trash without first rinsing them with water and allowing them to dry. 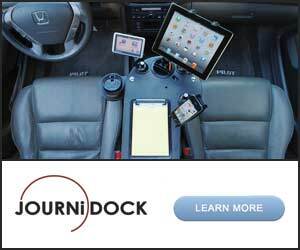 This will eliminate the risk of combustion. 7. After allowing the stain to dry over night, apply a coat of polyurethane to match the gloss of the existing coating. Allow to dry and add an additional coat. 8. Remove the tape and reattach any hardware that was removed. These same steps can be used for any stained trim, door frames, cabinets – any thing that has been stained and needs touching up. 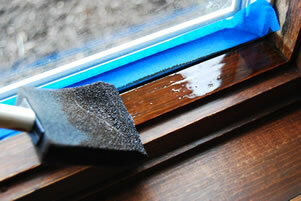 Remember; don’t add stain to a surface unless the existing protective coating (such as polyurethane) has been removed. The stain will be resting on the protective coating and not in true contact with the wood and is basically not doing what it is intended to do. For those of you who own painted trim, the steps are basically the same. 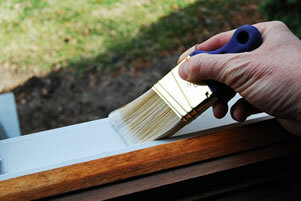 Use the same practice of painting an entire section of trim. 1. 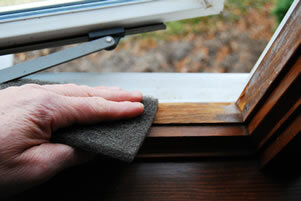 Start by removing any dirt or dust by wiping with a damp soft rag and or dust brush. Do any repairs to the trim before painting. I know it’s more work but you and I both know it has to be done! 2. Sand the area smooth using the 150 grit sand paper. 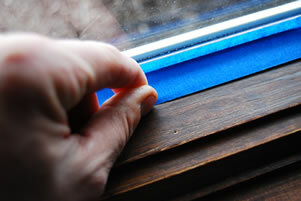 When sanding near window glass, use your finger tips as a buffer between the paper and the glass. 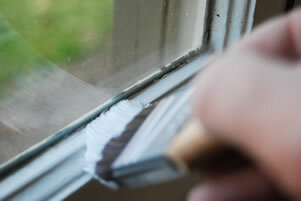 It will protect the glass from the paper, but get you close enough to prep the trim. 3. Spot prime the area (especially bare wood) with a latex wood primer. 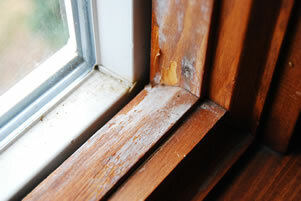 This is critical; priming evens out the surface and protects the exposed wood. 4. Lightly sand the primed area with 220 grit sandpaper, being careful not to break through the primer. The reason you are doing this is because the primer will raise the grain of the bare wood, the sanding smoothes the raised area. 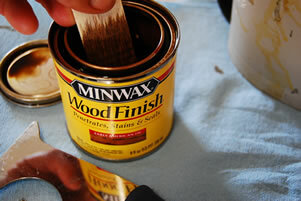 * This is a good tip any time bare wood is primed, it should be followed by a light sanding to smooth the surface. 5. Apply a coat of latex paint to match the existing gloss. 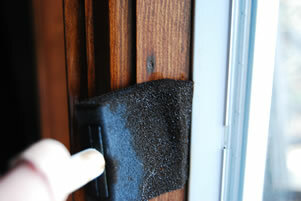 Remember these steps can be used for touching up door casings and base boards as well. I can’t stress enough that you should always do an entire section and not just a quick touch up. It’s my opinion that it will look just as bad as a ding or dent in the paint. If you make it an annual practice to touch up painted and stained surfaces around your house, (and this includes wall surfaces) chances are your painted and stain surfaces will look great and last longer, which could eliminate the need for a complete redo. I hope this helps you see the cost and time savings advantages of tackling the small jobs around your house before they become big jobs! Thank you so much for the tutorial. I found it through Pinterest. I was wondering, how do you repair knicks and such in the woodwork before touching up the stain. (ie chew marks from a puppy with separation anxiety when we were outside mowing– Bad Dog!) Would wood filler be enough, or is there a better product out there? Hi Katie, I asked Matt about this and he said he would use a wood filler for that project. Just make sure to match a filler to the stain so that it blends nicely. The problem with scratches is that you will always see the repair, but it will look better to build it back up to the original surface height. Hi Ruth, yes, the stain is a Minwax Wood Finish, color EARLY AMERICAN 230.
thank you for the great tutorial! very helpful. how do I prevent damage to my carpeting while working with these products? Thank you for taking the time to do this. This by far the best tutorial I’ve seen.Do I need to sand the window sills if they are not painted? Anne, Are you saying the window sills are new wood? Or are they stained? I think they only have polyurethane …the parts that are fully faded are clear wood, the parts that are still fading have white flakes and when I wipe out the flakes it becomes clear wood…I hope I’m making sense. I’m really new at this so I appreciate your help. I can send you a picture of what I’m taking about if the description is not clear. Why does everyone keep saying not to paint the woodwork? If the house was built in the 80s or later, natural wood usually looks bad. It makes the rooms look dark and dated. White trim looks much better and sells faster. Now if the house is 30s or something, then yeah it may make sense to avoid painting it. Hi Lindsey, you have a good point there. And, it is so often just personal preference. Personally, I don’t like the heavy grain of oak, so if I had something in oak, like trim, I would want to paint over it because ti’s MY house and I want to LOVE it. Do what’s best for you!